Our before and after-school program offers the school-age child a welcomed break from structured academic learning environment through a variety of activity zones that further enhance his or her creativity, problem-solving and decision-making skills. In our fun, productive and supervised environment, each child also has the opportunity to develop special friendships. By meeting with parents, our teachers can determine what each child requires after school. 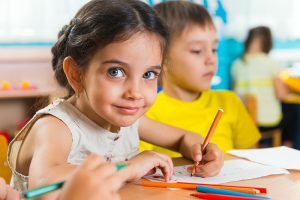 Perhaps an older child needs more help in order to complete homework assignments, or a younger child may need special tutoring in reading or math. This also is a good time to let the children learn more about computers, which are available at the center. Yet our teachers know that after a busy day at school, children need time to play. Supervised playgrounds give each child the chance to direct that special energy only children have in a healthy way. The Discovery school-age program is designed to extend your child’s academic learning from the traditional classroom setting into our quality learning center. Overall, our goal is to foster a fun environment for children where they can acquire a positive self-image, and develop social skills that build creativity, imagination, and self-awareness as they interact through daily activities. Discovery Learning Center provides transportation to the following elementary schools: Rosa Parks, Sonnie Penn, Martin Luther King, Christa McAuliffe, Coles and Enterprise.